Some performances are so poignant that they are too good to be true. 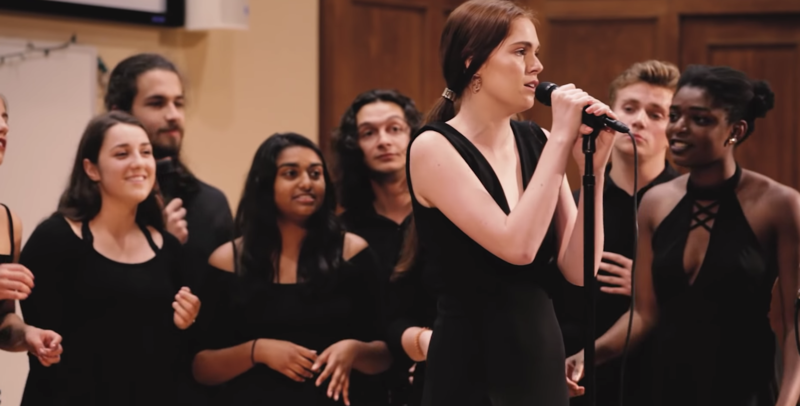 Such is the case with this cover of Sara Bareilles' "She Used to be Mine" by THUNK a cappella from Northwestern University. There's a gentleness to the cover that's calming as the a cappella group delivers a soft, yet warming performance in the song's first half. Then THUNK's Aiden Fisher intensifies the emotion in the second verse, and holy cow! We're off to the races. She quickly sheds her somewhat shy demeanor with excruciating dynamics that she summons from her core. You can literally feel her heart breaking onstage with each refrain. It's captivating, mesmerizing and wonderful all rolled into one. And then the big notes continue to bombard you until THUNK reels it all back in for one final, sentimental blow in the form of their final stanzas. This is a performance for the ages, and we hope someone from Sara Bareilles' camp has shared this video with her.